I knew it would happen. Eventually, the name of the Covington student noted in the protest march would be revealed. 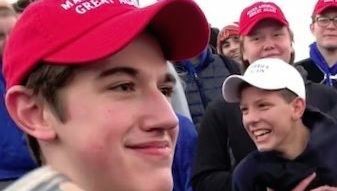 In an updated statement, Nick Sandmann, the Covington Catholic High School junior provided his side of the story. I’ll summarize it for you. In all honesty, I watched the entire video of events preceding the viral images. It’s an hour and forty-six minutes of my life I’ll never get back. Like Sandmann, our inability to see our own personal failures is paralleled by our inability to see our church and parental leadership sins as well. Christians are usually sincere and well-intentioned people until you get to any real issues of ego, control, power, money, pleasure, and security. Then they tend to be pretty much like everybody else. We often gave them a bogus version of the Gospel, some fast-food religion, without any deep transformation of the self; and the result has been the spiritual disaster of “Christian” oriented version of proud, racist, and superiority class conscious. Here’s why Sandmann and the adults supporting them were wrong. The MAGA hats are just the most recent and most visible symbol of a racial divide. It’s used to identify oneself as part of this group to the exclusion of others. These high-school kids wear them mostly for fun, without comprehending its divisive nature. For such a seemingly small accessory, it’s associated with the emotional impact of the president’s entire campaign and term so far: every comment he’s made about Mexicans, women, or immigrants, the Muslim ban, the threats against bodily autonomy and affordable health care. These are broader issues to which the Covington High School students would probably never understand. At the 1:09 mark, one kid (I presume a Covington high schooler) removed his mega hat, his coat and his shirt and led the students in a chant. To which I say, how is that Christian? Where in the Bible did Jesus remove his clothes, strut around bare chested and chant. This leads me to believe that neither the kids nor parents really understand Jesus. When religion does not move people to the heart of love, it solidifies angers, creates enemies, and is almost always exclusionary. At this level, it is largely incapable of healing, reconciling, forgiving, and peacemaking. When religion does not give people an inner life or a real prayer life, it is missing its primary vocation. Their religion has never touched them or healed them at the unconscious level where all of the real motivation, hurts, unforgiveness, anger, wounds, and illusions are stored, hiding—and often fully operative. Let’s face it. Covington High School students got played. Parents and students alike let their ego get the best of them. All we saw was grandiose behavior while insisting nothing but a high and legitimate ambition to win a battle for either life or Christ! As Jesus put it, we “see the splinter in our brother’s or sister’s eye and miss the log in our own” (Matthew 7:4–5). So, congratulations Sandmann, that video will follow you forever. No PR firm will remove that smug smile. Jesus was nowhere to be found in that mess.